Charlie has been devouring Secret Seven books and along with American comics set in the 1950s (Tubby and Lulu) has developed a huge passion for having a club. With two local (homeschooled) friends he as made up a club. They have a name, rules and quite a charter by the sounds of it. There are plans for a clubhouse to be built upon our return from Europe. They have been meeting under the house in the “base” there, but have decided that they are too big and want a real clubhouse! At Easter they had a club Easter treasure hunt (sorry I cannot reveal the club name it would be hazardous to my health…). Here they are receiving the instructions for the first clue. All very into fariness they had turns reading and picking up the clues. 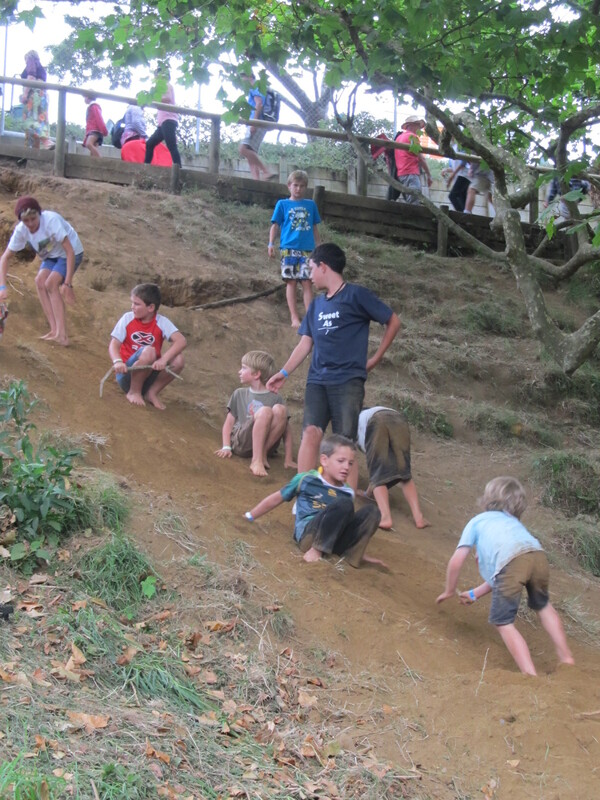 The trail took them all over the place…. But of course they won out in the end with the loot! I love seeing them so intensely organising a mini world. They have the rules, the structure, the same things they see in the adult culture around them, mirrored in their own corner of the world. This age is amazing, they have just got the freedom to step out alone, bike around the village together, go the the local pool together free of adults. And for a few years this is coupled with imagination and the joy of seeing the world through their child’s eyes. So exciting for them. I remember my own club I had at 10yrs. It was a “sneaking” club – a bit like what Charlie is into now, spying. 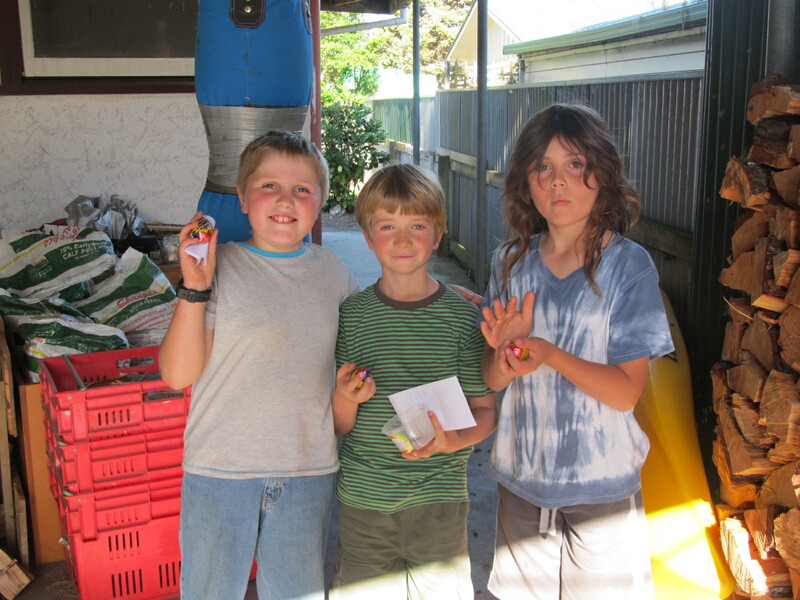 We had badges, a treasury, meetings in our secret hut and used to go off around the community on missions. Such fun, until adolescence sneaks up and pushes it all away. So long live the Club and I look forward to the building of the new club house in the spring when we return….unless Wayne wants a nice winter project….!!!. 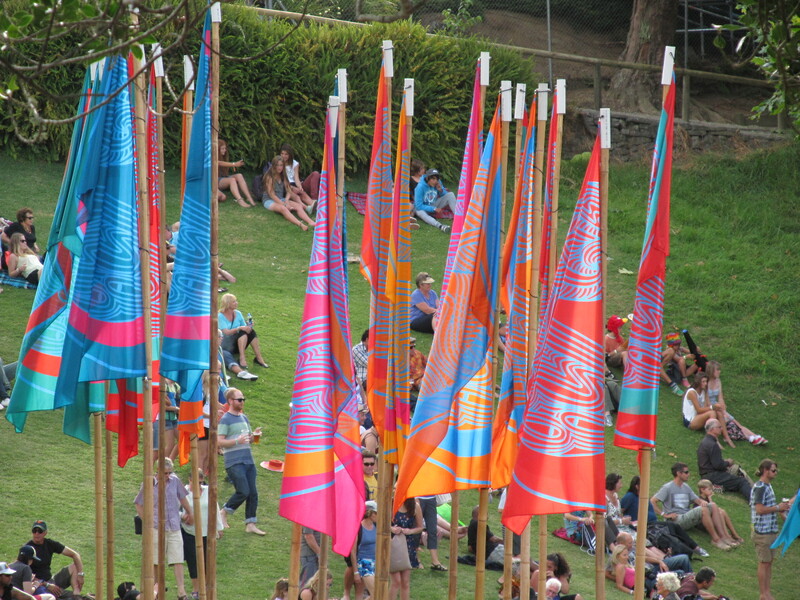 World of Music and Dance, musicians from around the globe, a stunning natural setting,with amazing flags and food to boot, what’s not to like?? So this year, with two other families (great friends), we decided to take all the kids too. One of my favourite things about having children is seeing them express their own individuality. They have always showed a real zest for life and embracing new experiences. I hope that my encouragment and role modeling has shown them to try new things, take up every opportunity and to live fearlessly. 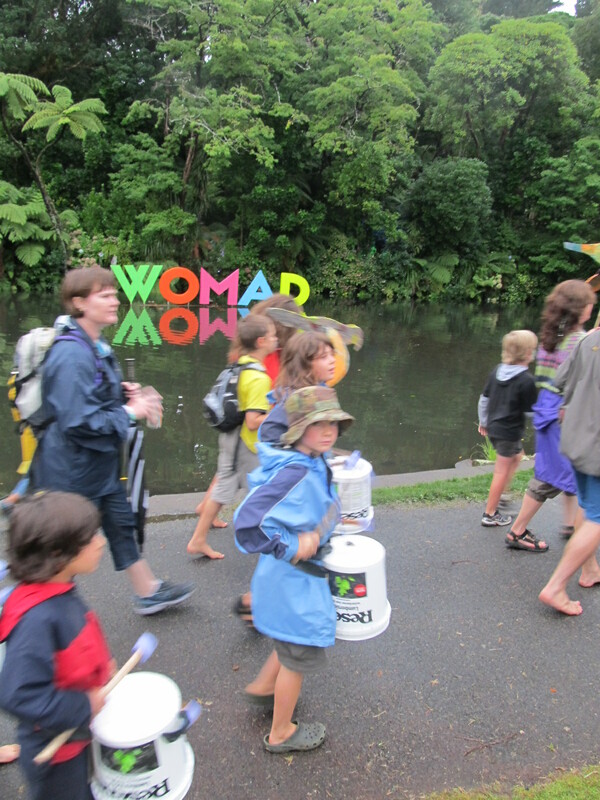 I loved what they did at WOMAD…. 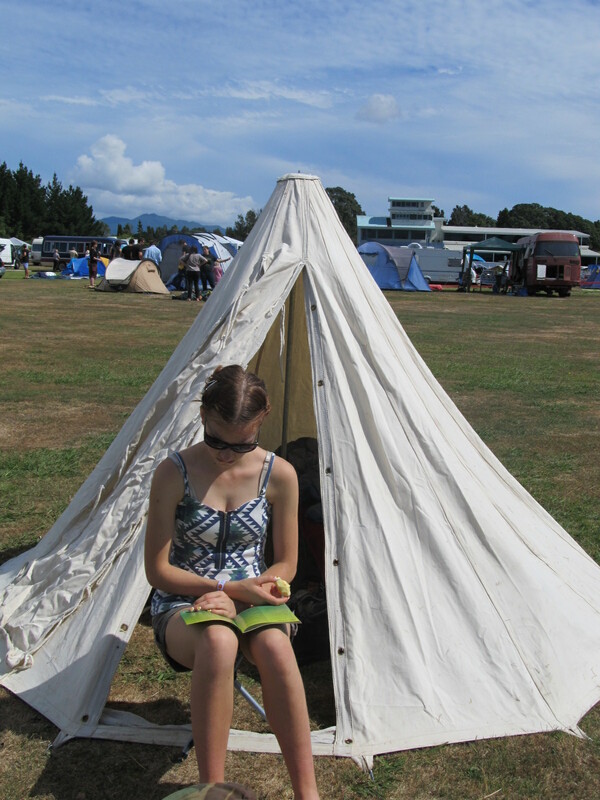 Hannah got straight down to business with the programme as soon as her tent was up and set herself a busy schedule of seeing as much as possible! Hannah’s friend Ina was there too and what a great couple of young women they are. As a parent I totally love their independence. They were so happy to do their own thing including coming “home” to the tents at midnight when the music finished. Needless to say they both had a ball!! Whenever I saw them they were buzzing with what they had seen/eaten/bought! There was a very safe, trusting and loving feeling among festival goers, Ollie too felt safe staying alone and making his own way back each night. I love seeing what Ollie does in a new situation! Not a big muso, I wasn’t sure what he would “do”….However he discovered the cooking shows and went to every one!! So much so that the celebrity presenter greeted him like an old friend when I went to one on the last day with him!! He also did the classic Ollie thing which is to go deeply into one thing in this case a group called The Aleav Family from Israel. A family of men- brothers & cousins headed by the patriarch – Grandad. Their concert was fantastic, Ollie loved it too. He also loved their cooking show, their workshop, and their spontaneous jam in the CD signing tent! He went up and talked to them, asking them about martial arts (he loves Krav Maga which is an Israeli one), and he got a photo with them. Since being home he has joined their facebook! Ollie loved all the food stalls and spent hours just wandering around checking everything out. He loved the buzz, the crowds, the whole feel of the festival and yes, he even loved much of the music! After his number one choice, (above) he really enjoyed some late night DJ music and among others The Correspondents. Check them out below. Their stage show was wild! The guy with the Harry Potter glasses danced up a wacky, manic storm like nothing you have ever seen! 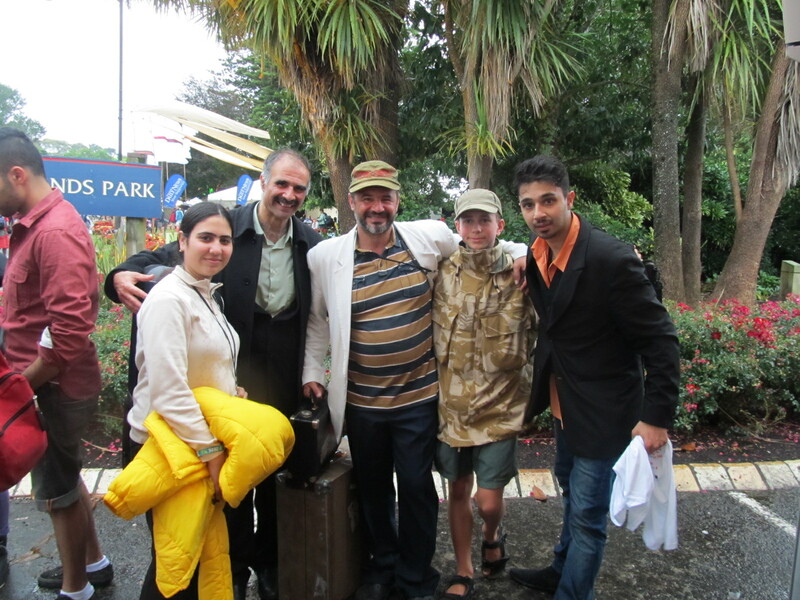 I bumped into Ollie now and then but we were rarely altogether back at our “base camp”. Here is a rare moment altogether…..
And what did Charlie do? Well, within 5 minutes he had the lay of the land sorted out. He loves maps, so he took off with the map of the site, marked things on it, whizzed around and was set! Charlie loved buzzing around too, off to buy an ice cream, off to the kids area to make a drum or watch a show. His favourite thing was the inside the beautiful hexagonal tent of the Tibetian Monks. 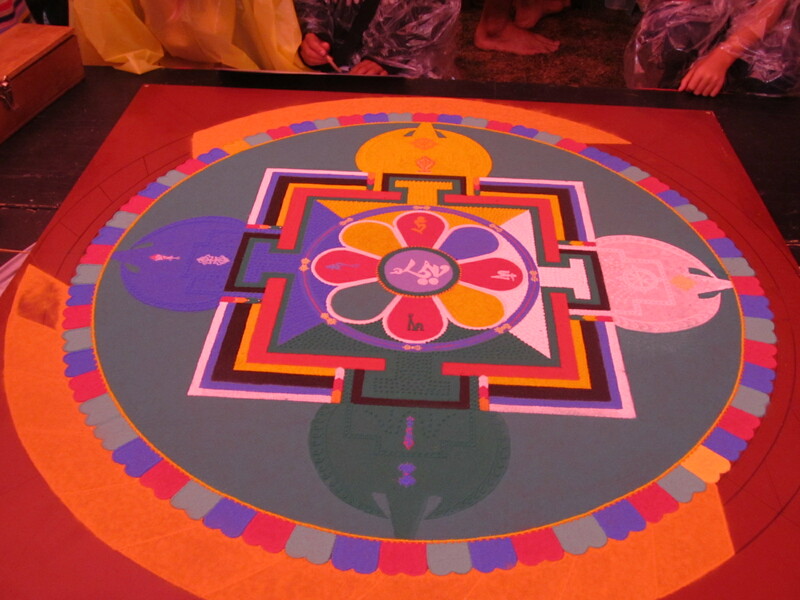 Here, over the three days, they slowly constructed a coloured sand mandala. Here is Charlie in his prime sand watching spot. He was captivated and it was hard not to be. Here is the nearly finished Mandala. …. Charlie and Henry marching in the parade on the last night,with the instruments they had made. The parade was huge and gave the participants a good long march around to much brass and percussion. 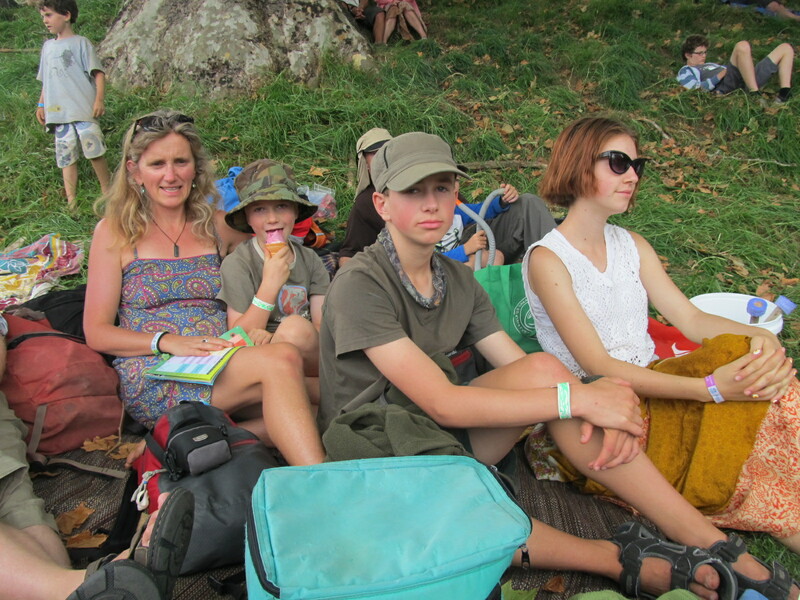 The whole festival was as amazing as ever, helped a lot by the incredible venue, in a gorgeous park surrounded by bush, a natural sloping hill down to the main stage (there were 5) which is situated in a lake. And of course a huge variety of awe inspiring music from all around the globe. 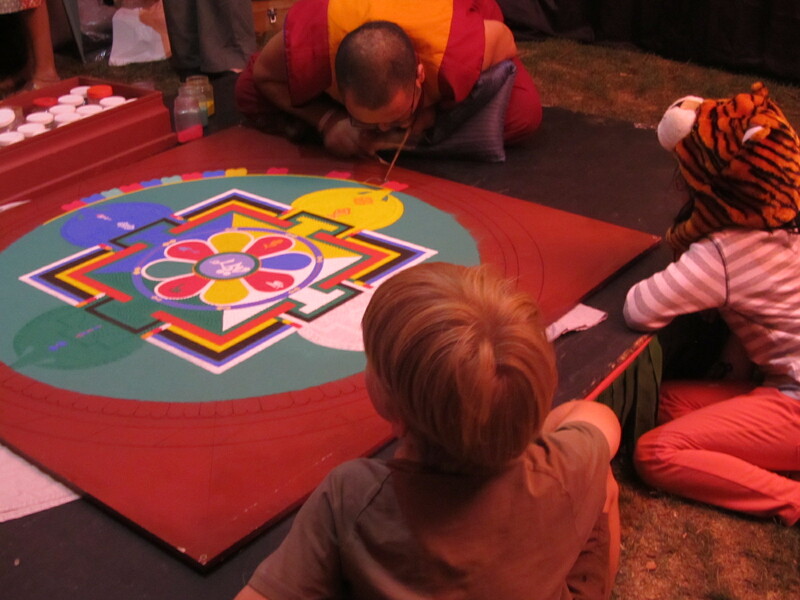 On the last night the Tibetian Monks performed a mandala dissolution ceremony to close WOMAD. They carefully transported the Mandala down to the main stage on a buggy, then played some beautiful music on traditional instruments while two of the monks carefully swept the mandala sand into the centre using their hands. Then some of the sand was tipped into the lake. The Mandala is symbolic of the non permanance of life and a chance to practise non attachment. Charlie and I had come right down to the waters edge for this, the last act. We sat and watched the monks set up on the stage just across the water. It was still and warm with a low misty cloud, but no rain. 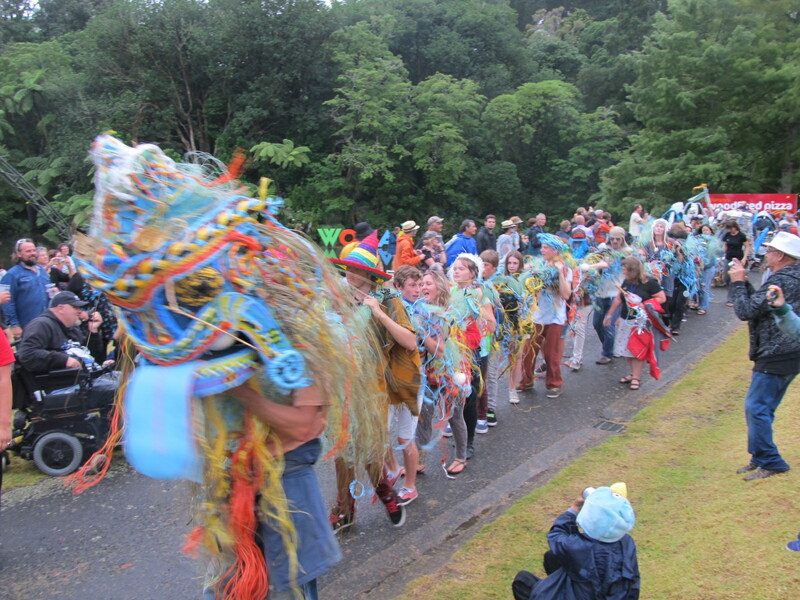 As the last notes of their music died away after the ceremony and a Karakia (prayer ) was given by a local Kaumatua, the Monks got up and waved goodbye. 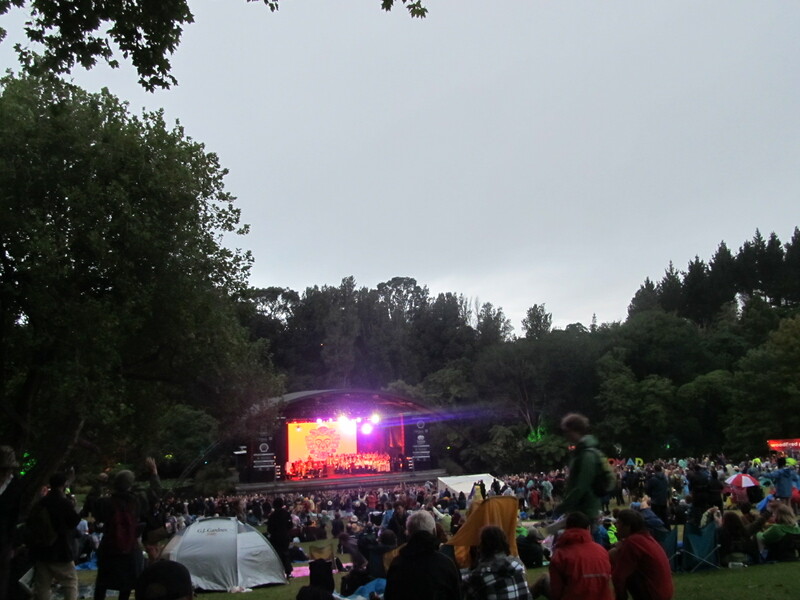 A woman behind me started to sing the well known waiata (song) Te Aroha, we joined in and sang our thanks to the monks, to the organisers, to everyone around us, to all the performers. 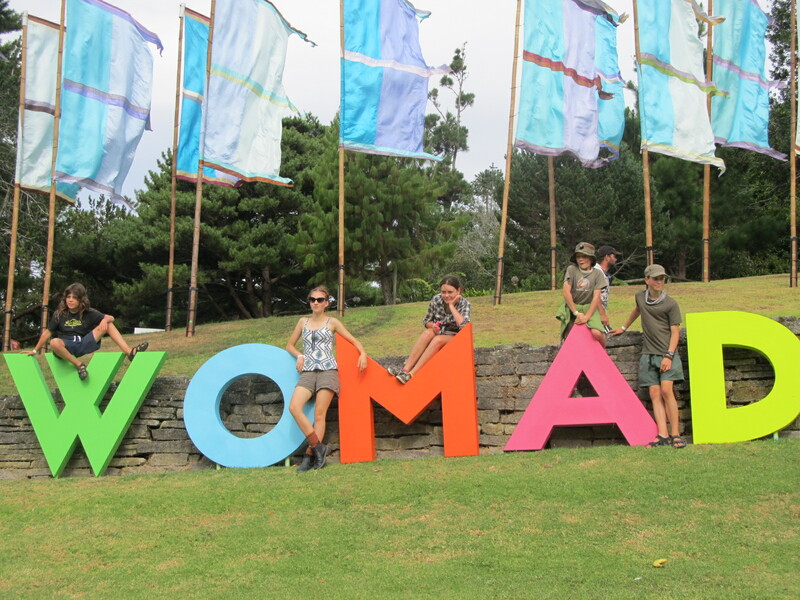 It was like a big blessing on the beauty of the place, the sentiments and sharing that had gone on at WOMAD . It was the perfect way to sum up our weekend and the way so much great music had touched us all. 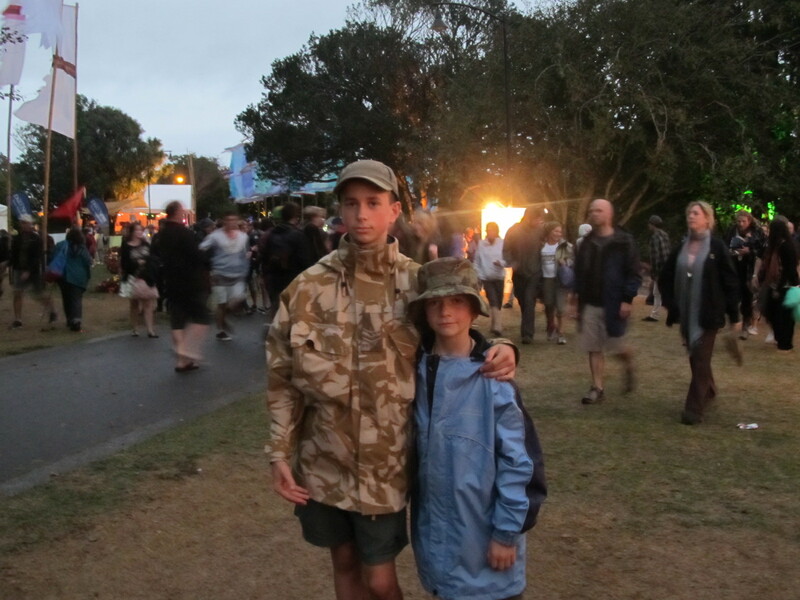 Ollie and Charlie at dusk – we did get a bit of rain on the last day,but not too bad – greatly welcomed here as we have been in drought conditions! The main stage just as the light begins to fade. 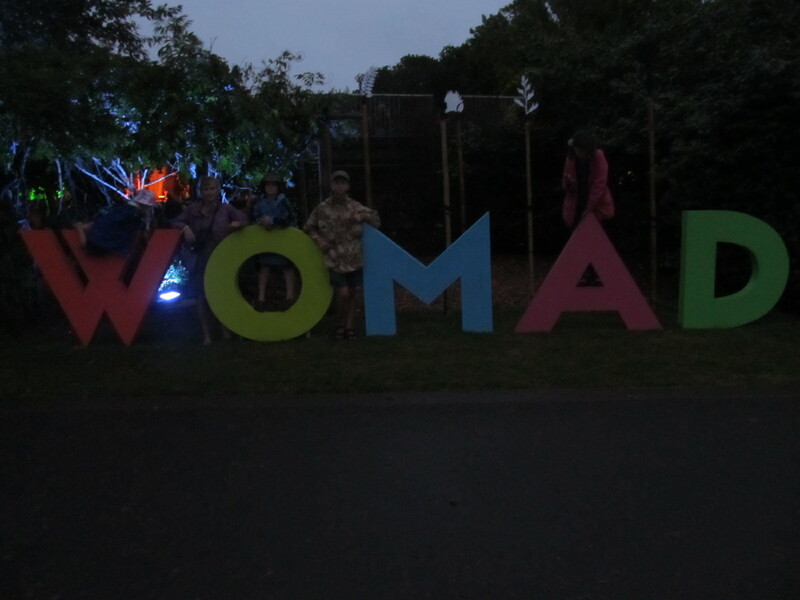 The boys and I, needed a flash really, but hard to resist posing on those giant letters! Charlie really wants a dog. He is a real animal lover and is very attracted to animals. Because his mother is a bit of a gypsy and likes to take off for adventures this has been put off. Last week Charlie had the opportunity to dog sit for a day. 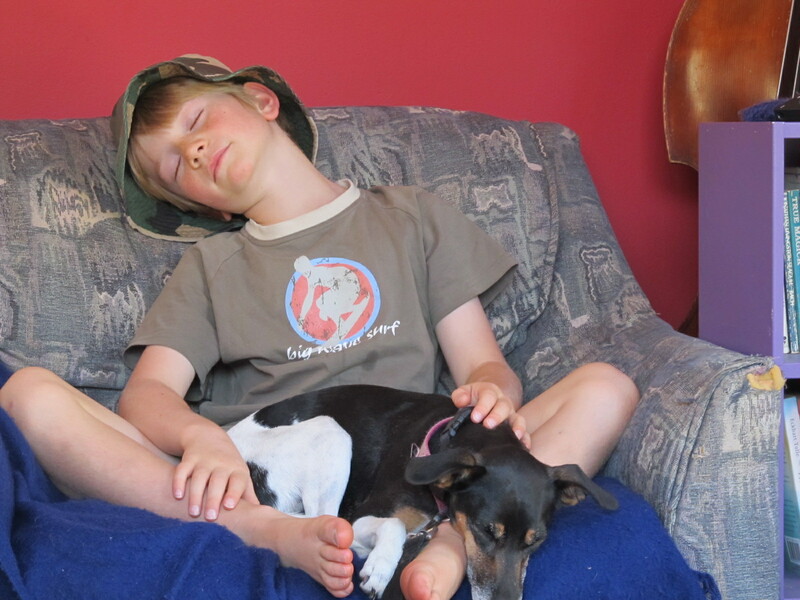 We looked after a friends 4 yr old Fox Terrier and decided she was the perfect pet for Charlie…. Abbi got a lot of exercise that day…in fact so did Charlie until he realised that he didn’t have to go at her pace, a full sprint, all the time. Abbi was so obedient and so loving! One of them is faking sleep… although they were both knackered after a full day of playing. It was a joy to see Charlie with an animal his size and I have no doubt that he will be a wonderful dog owner. I have every intention of making this happen for him later in the year. Looking at the rewards it will bring, not at the obstacles. 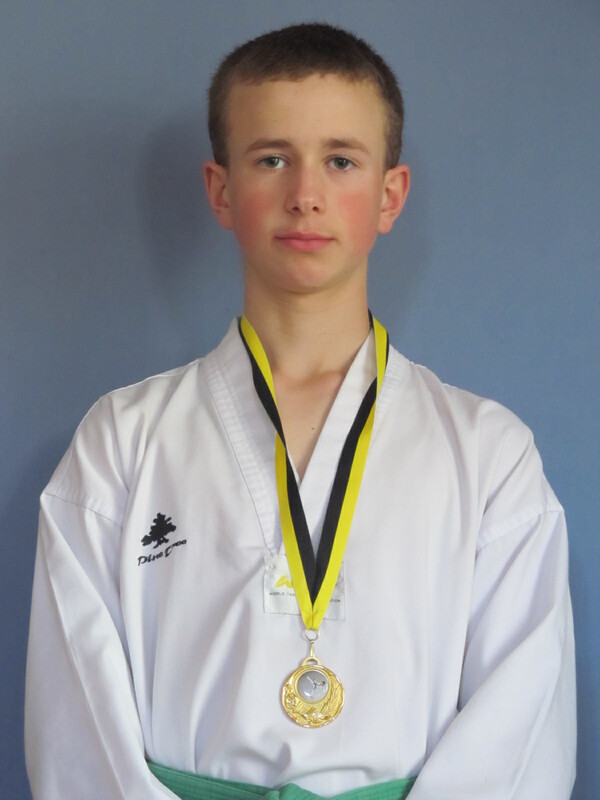 I am sure I have often mentioned how great Tae Kwon Do has been in our family…. 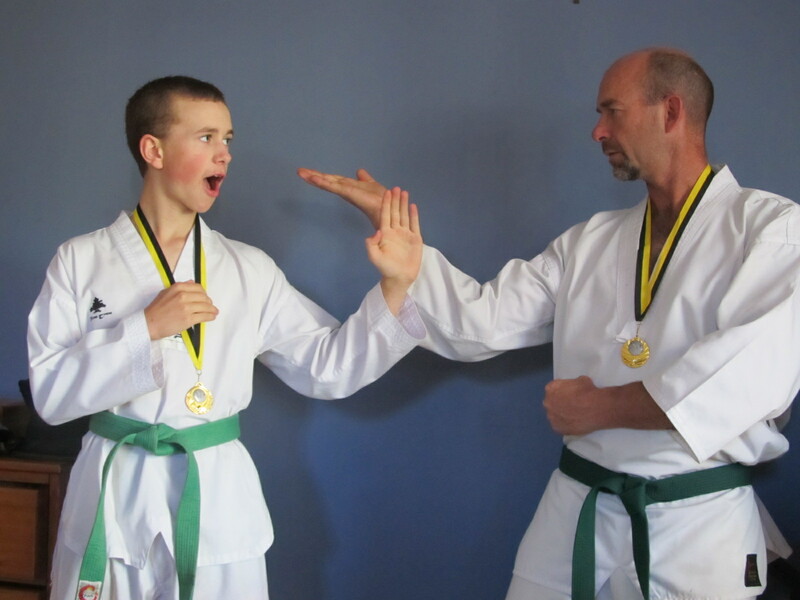 Wayne and Ollie have been training madly, and I mean madly, for the North Island championships. they both love the sparring – that is what you see at the Olympics. It is legitimite fighting, fantastic! Last weekend they went off and competed – they totally loved it and came home with a gold medal each! 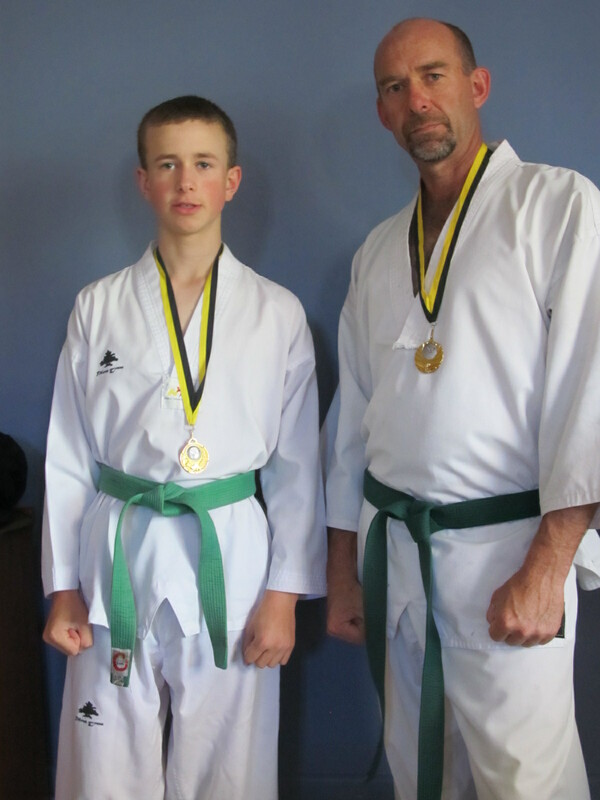 Both green belts, both gold medalists…. Very cool.Ollie is so passionate about it, which is just such a joy to see. What else could parent wish for a child than to hear them say they love doing something and then help them to do it? To be happy…..what else is there? 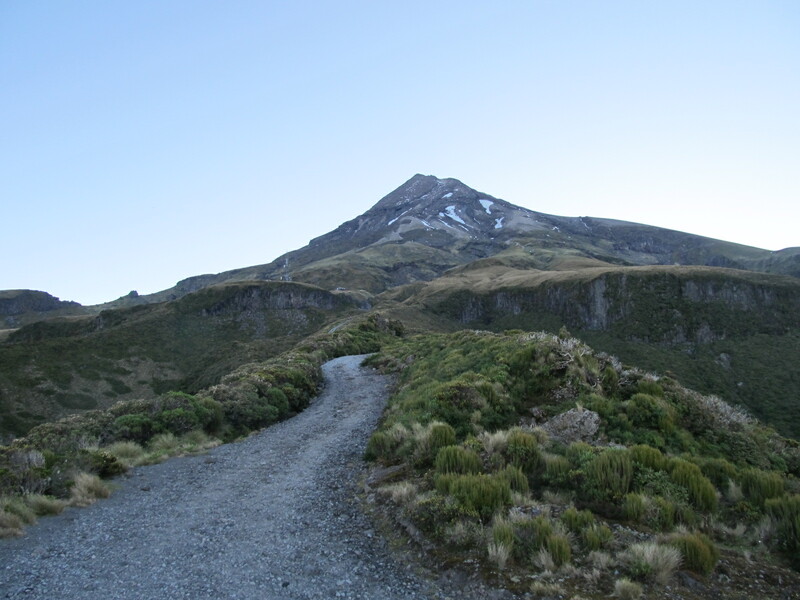 I have returned from summiting the formidable Mount Taranaki! 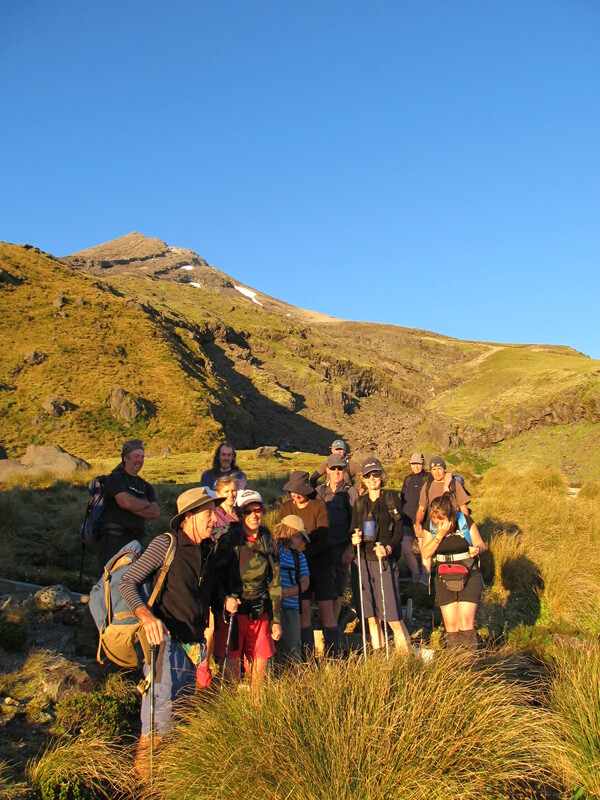 In the end there were 14 of us walkers who set out on the Friday night to stay at a gorgeous (electricity, carpets, full kitchen) private lodge half way up the mountain. This was steep and took just over an hour. 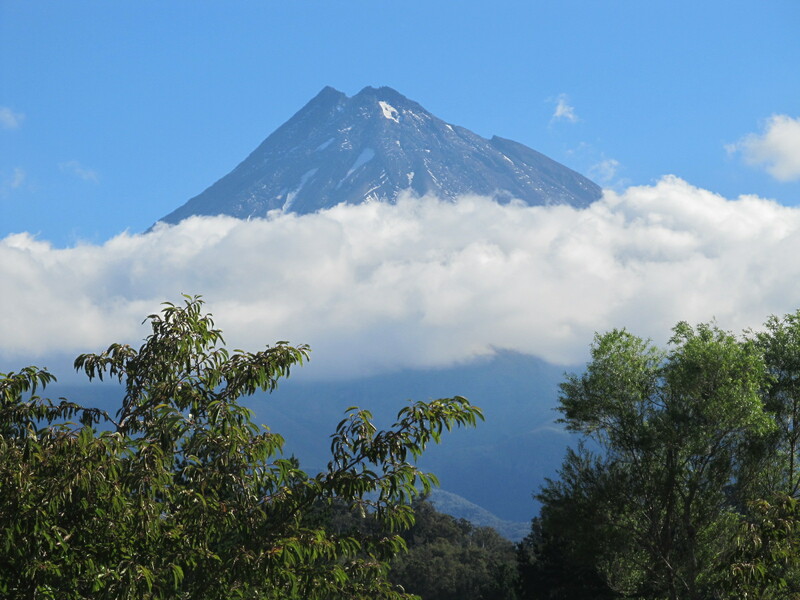 On the road up Taranaki had a scarf of cloud about her shoulders. I love this giant shadow of the classic volcano shaped peak lying across the plains below. 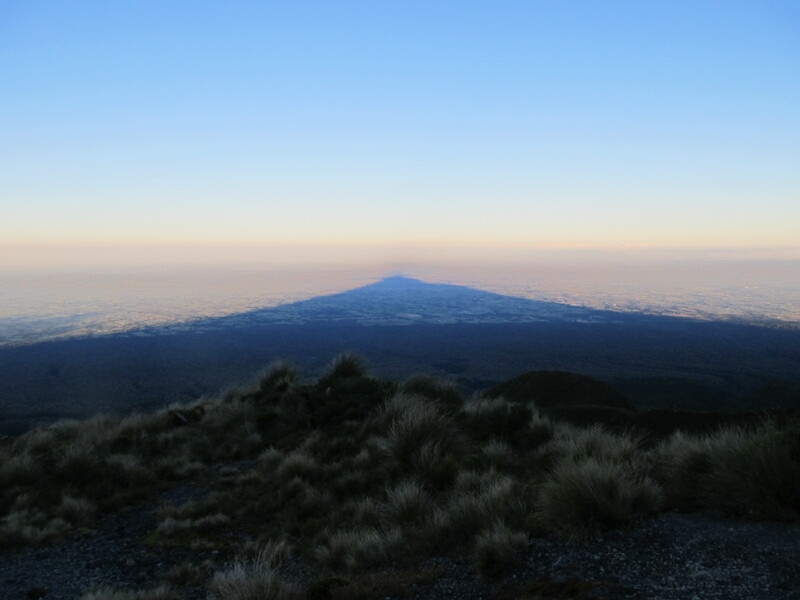 Tahurangi Lodge is at 15oo m above sea level, the summit is 2518m. Saturday morning we rose at 6am to watch the sunrise and prepared to set off. Many people were already well on their way. 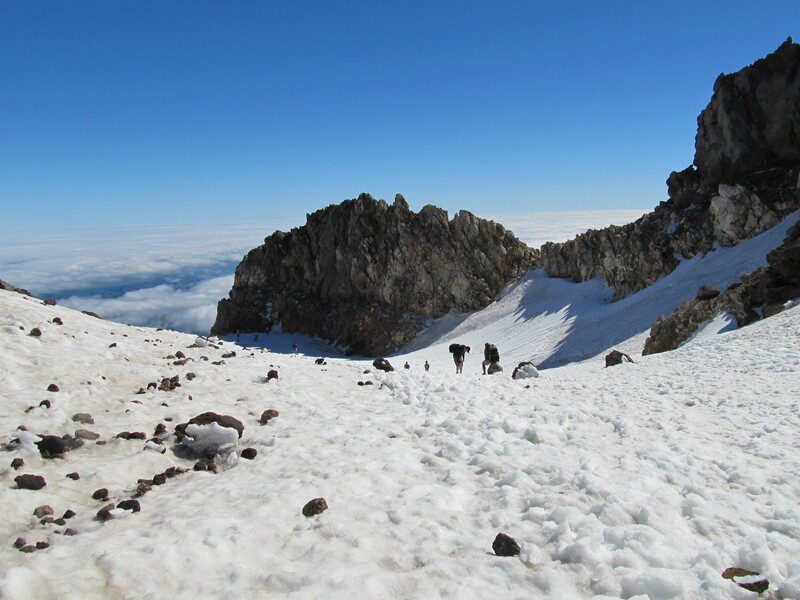 A local told us there can be 300-400 people a day summiting on a sunny weekend. 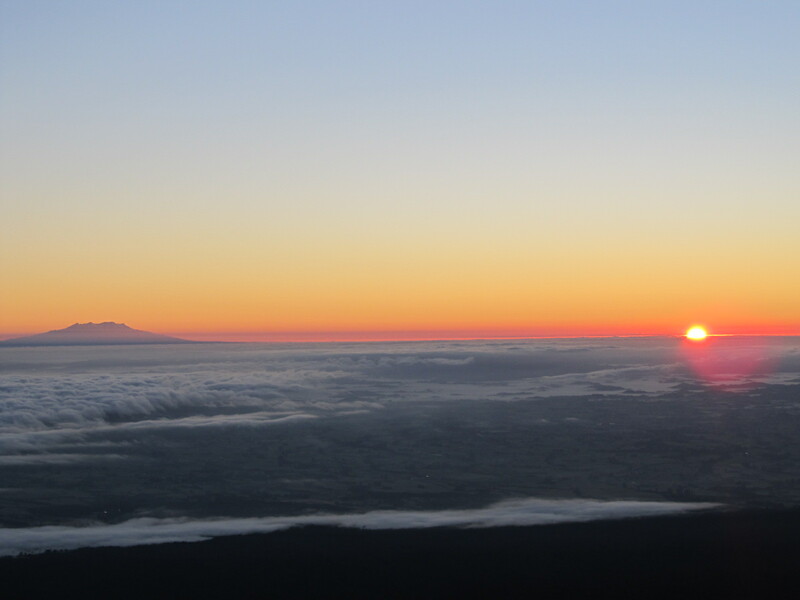 Mount Ruapehu on the left looked tiny from where we were, as the sun rose across a bed of cloud that stayed there all day, while we climbed in hot sunshine. The walk has very distinct terrain. 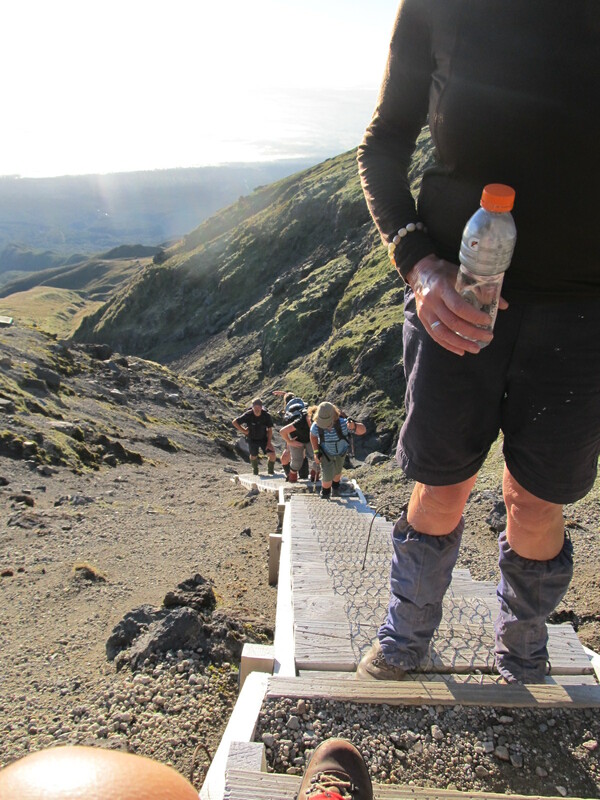 There are 440 steps, then scree, then volcanic rocks to clamber up. Our party setting out in the first rays of sunshine…. 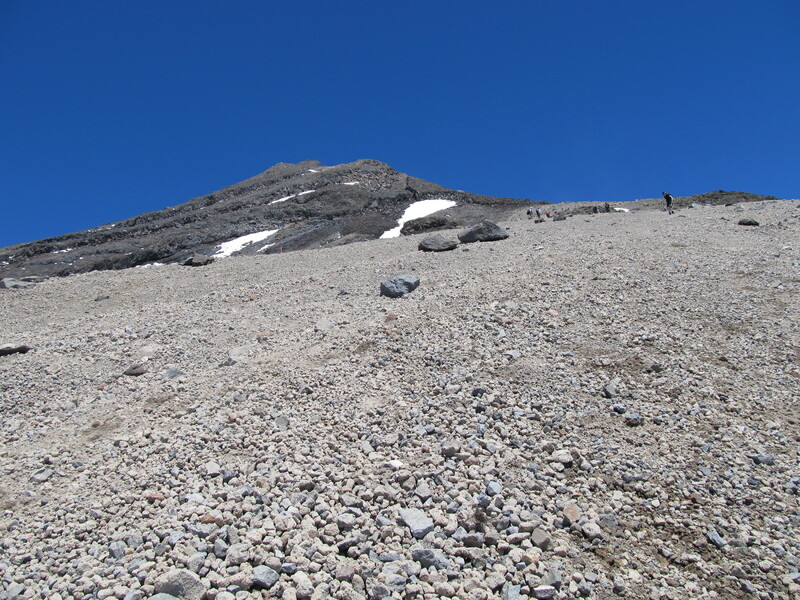 The scree – with a few patches of snow still hanging on. 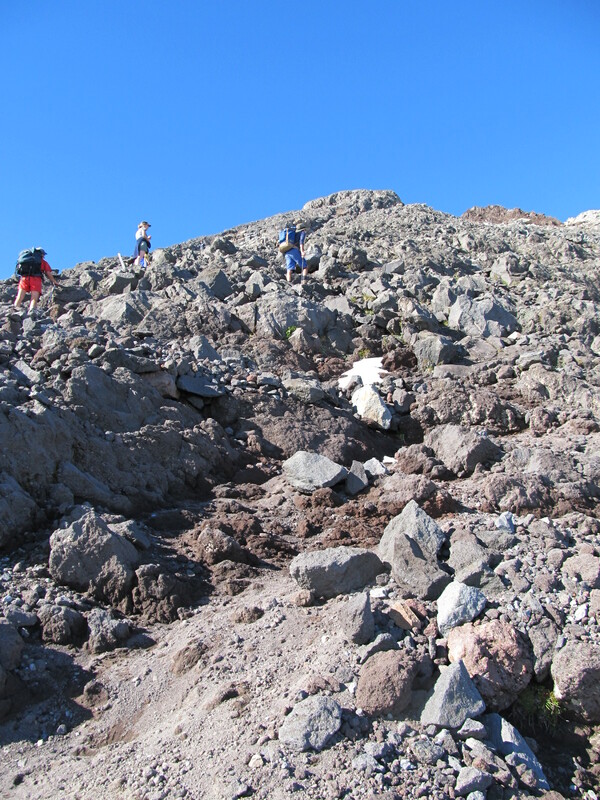 It wasn’t all fine, loose and easy to slide down, there were rocks to watch out for which made the descent a bit slower. The best bit of equipment for the steep rock clambering was gloves, to protect your hands. 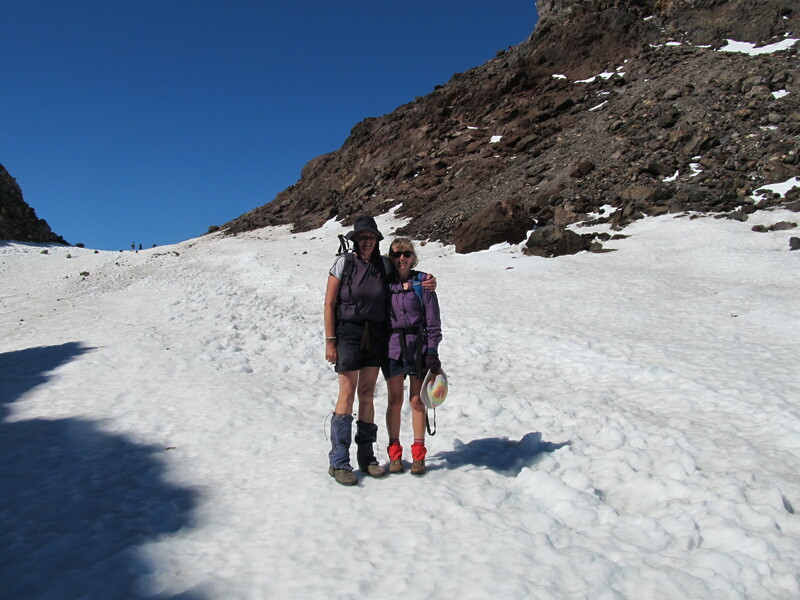 Birthday girl Alice and I in the snow filled crater. Champagne was served by friends on the true summit, a steep 15 min climb to the right of this. Looking down the crater . It is pretty amazing to be able to climb a volcano, even an extinct one. It adds a certain dash of danger to think of the power that exsists beneath your feet that appeals to the risk-taker in me. 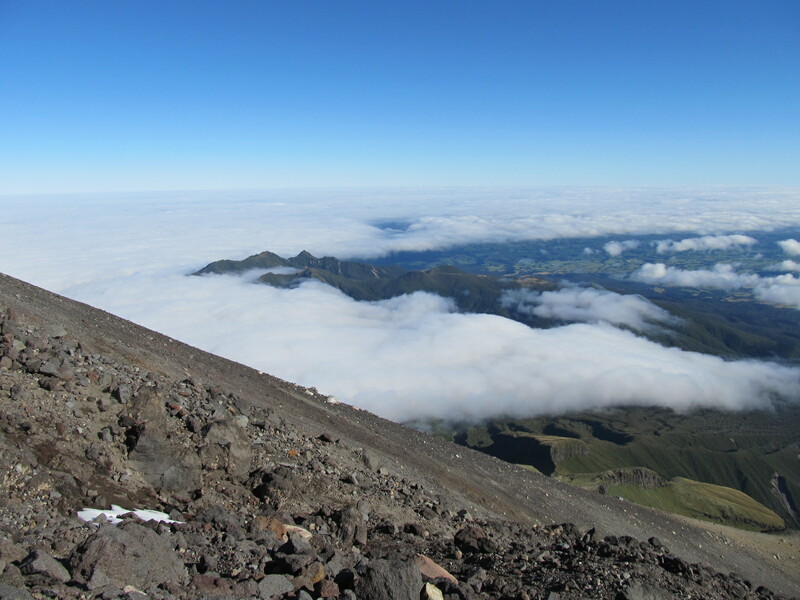 The gradient was steep,the views between clouds spectacular and the company fantastic! Tramping is such a bonding sort of activity. You set off with a group of mostly strangers and after just 24 hours they feel like your best buddies in the world. Also you know you are in the company of like minded people who love to seize the day, try new things, take risks and explore. That is such a blessing which inspires me. It was so great to chat (puff) to new people as I shared different parts of the track with them. And so neat to see another part of a Alice’s life, by meeting a range of her family and friends. Seeing her in a role different to that in which I usually see her. We stayed at the historic Camphouse after our climb where we were joined by other friends and family. Every time I am out and about like this I just feel so grateful for the freedom we have in New Zealand to get up and go to such beautiful places so easily. They are accessible, free and safe. I am also grateful for my family. This weekend there were many other things happening for our family. 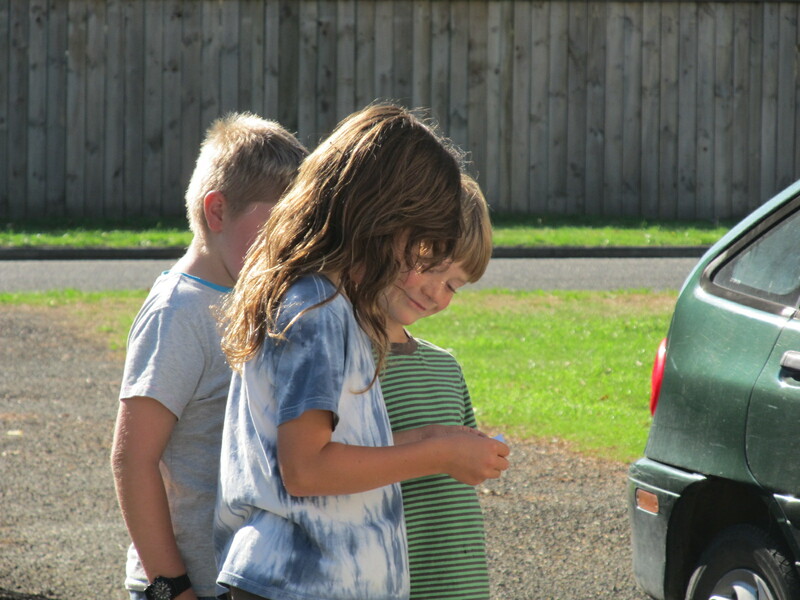 Having older children and a supportive partner made it very easy for me to take off on my adventure while they all had their own adventures and things to do. 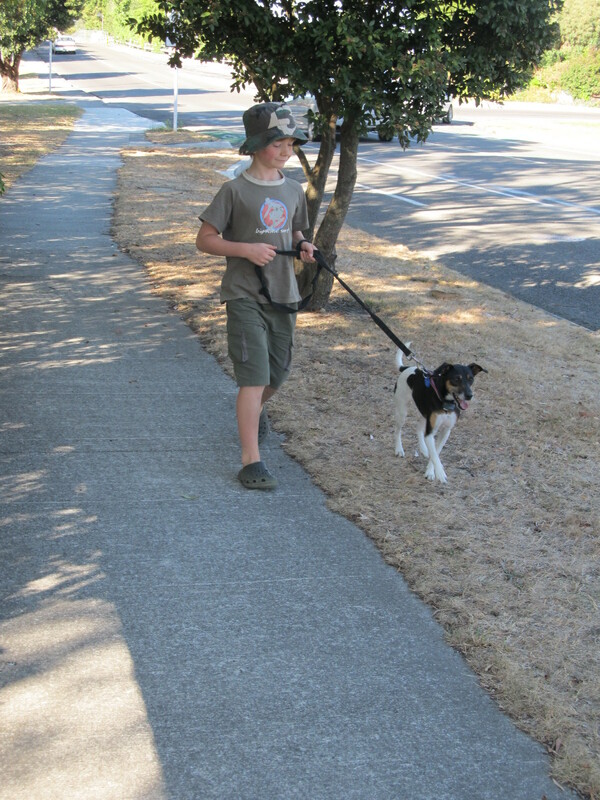 Ollie’s passions have been so easy and so interesting to follow. From the Army at age 4yrs, which still endures, he has expanded and diverted, taken side roads and unexpected detours. Survival, the outdoors, tramping, fires, knots, firearms, weaponry, first aid, Civil Defence, any surival skill imaginable and now… prepping! There is a TV series called Doomsday Preppers that has him fascinated as he has found a whole online world of “Preppers”. Just survival on a large scale, in the event of a large scale disaster – solar flare, economic collapse, environmental disaster, an EMP (electrical magnetic pulse), earthquake, flood, global warming, pandemic. Believe me I have heard about them all and Ollie is getting prepared for the lot. So now he spends every spare cent on food. 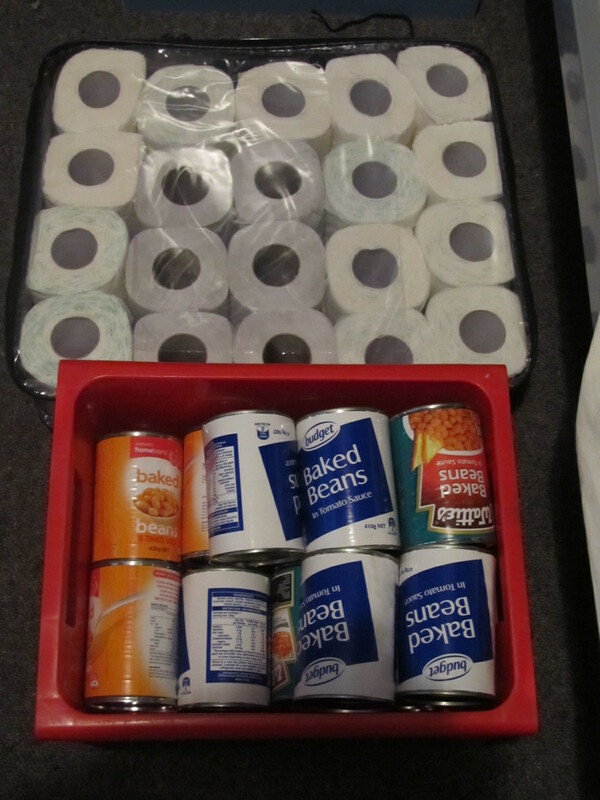 Tinned food, rice, toilet paper. 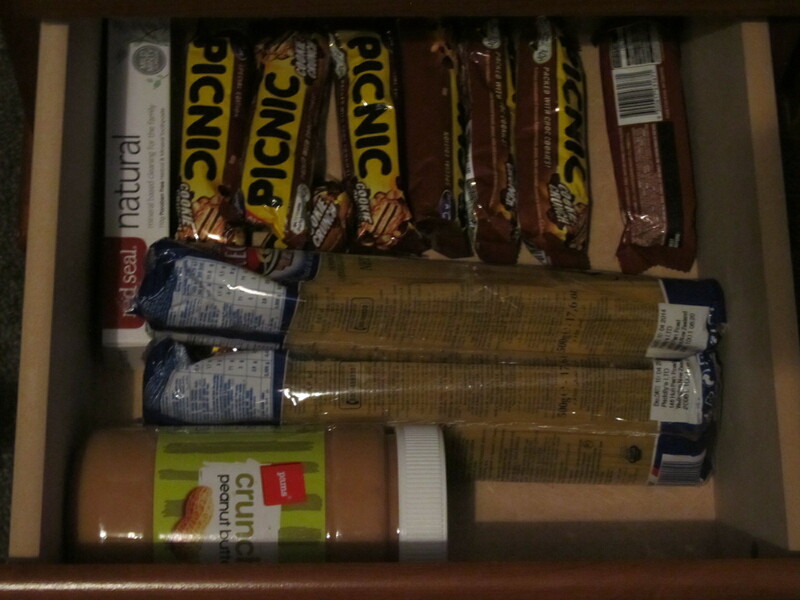 His room is turning into a mini mart. 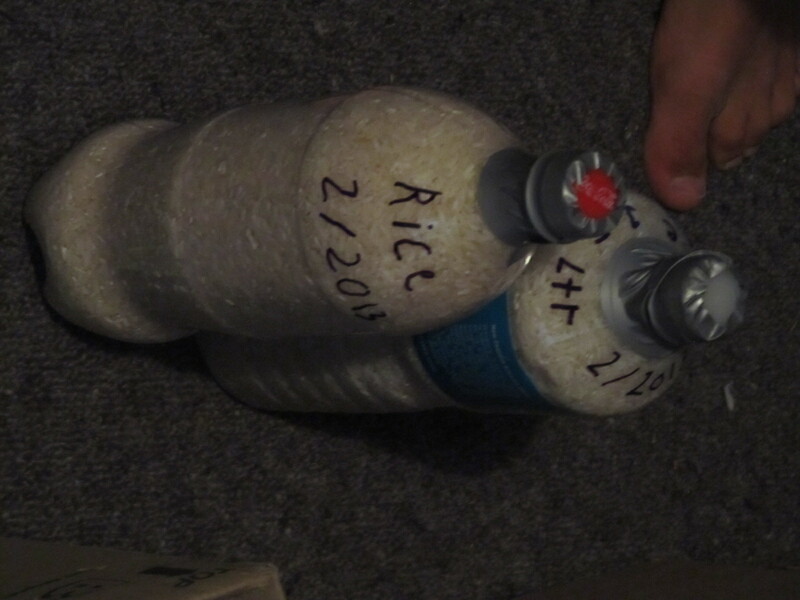 He tells me incredible stories of extreme preppers who manage to store (hide) their stashes in he most unimaginable places. Somehow he has managed to get me to buy several items a week with our shopping, which make their way on to my list. As he points out it is fair enough as he is really prepping for our whole family. He is already requesting supermarket vouchers for next Christmas! He may be mad, but whatever he does he does with a passion, well researched, well thought out and well executed. Luckily for him there is a whole online world of preppers (even raps made up). He can hob nob with fellow preppers, then come and patiently explain to us why we need Avain flu masks and lots of them. Good questions to be grappling with at any age me thinks! So while I continue to de-clutter and dream about our famiy living out of a small back pack each, Ollie is planning to feed us all for 6 months of disaster induced isolation. I totally support him and learn so much about his passions while he shares what he is doing. It is an amazing file of knowledge he has stored away and I know he will be the best person to be around in the case of a disaster. I just wonder though, what will come first….our world trip or doomsday?? 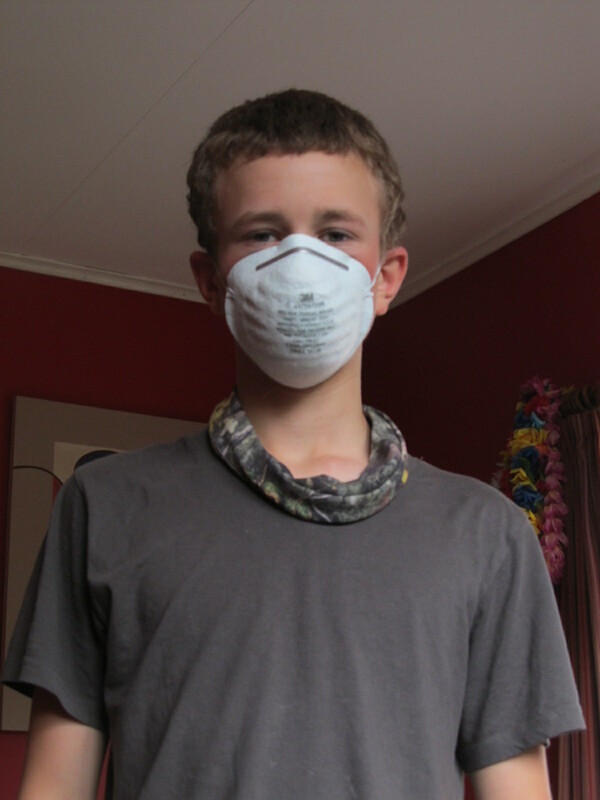 Ollie in one of his dust masks – good for after an earthquake. 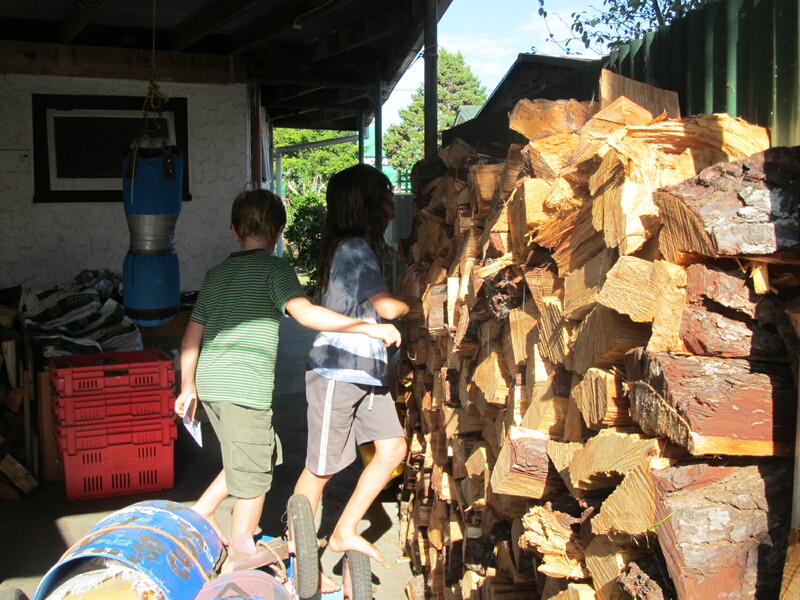 I feel as though I have always appreciated and supported the kids in their imaginative play. That has always been my intention. I have been so amazed over the years at the things they think up, develop and extend in ways I would never dream up in a million years. I have loved seeing how Hannah and Ollie extended their passions and interests into more concrete activities as they moved into the next phase. 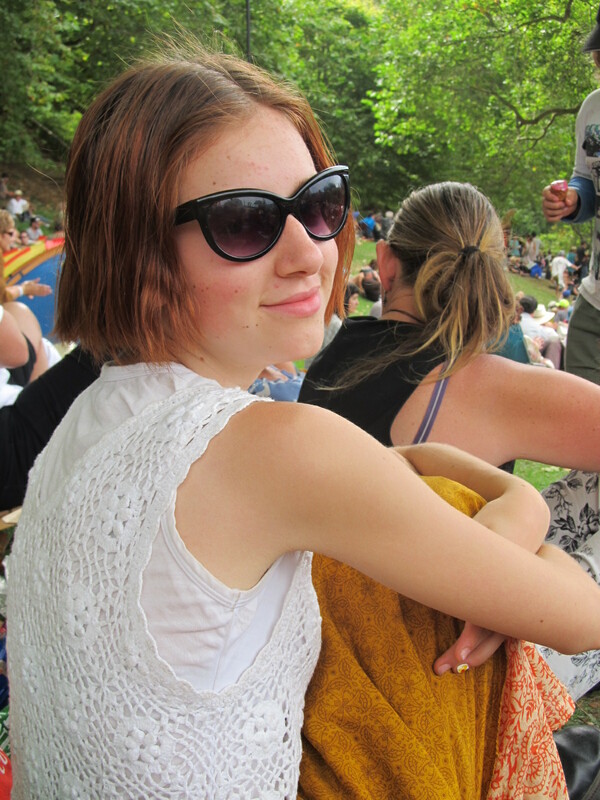 Hannah, who still has a vivid imagination, with writing & movie making. 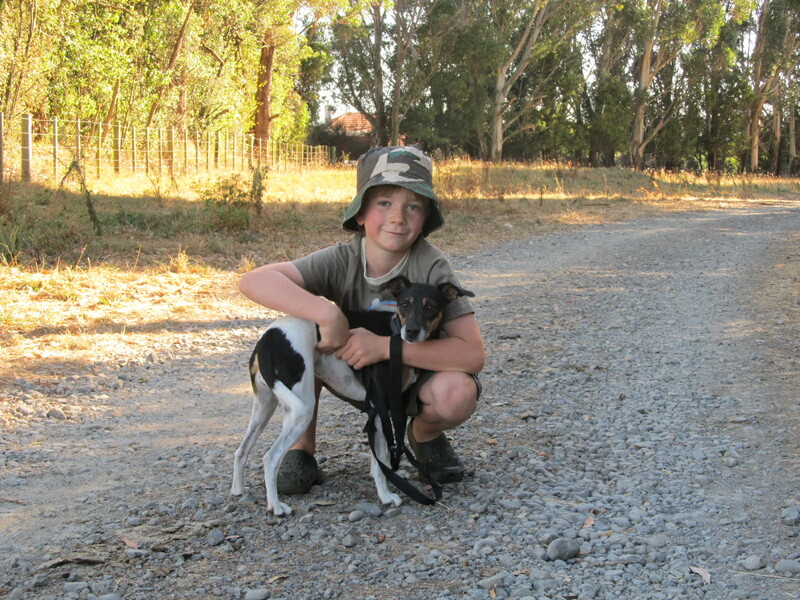 Ollie with making survival kits, and you tube videos to share his knowledge. So when I see Charlie “playing” still I so enjoy it. I just want to stop the clock. I want to lie down and roll around in his delightful, imaginative games. I want to bottle them. We had the sprinkler on the lawn. Charlie started to set up bases, made from chairs, old planks of wood…..He is peeping out from this one. Occasionally Charlie would go right up and through the sprinkler, mostly to cool off I think! I just marvel at the way children can transport themselves into another world. Out walking the other evening, looking at Christmas lights, Charlie had a stick (weapon) and that is all. But the whole time he was running ahead, hiding, calling out to imaginary comrades, ducking diving, shooting, rolling. He was just playing and having such a great time. I know I go on about the value of Play, a lot. 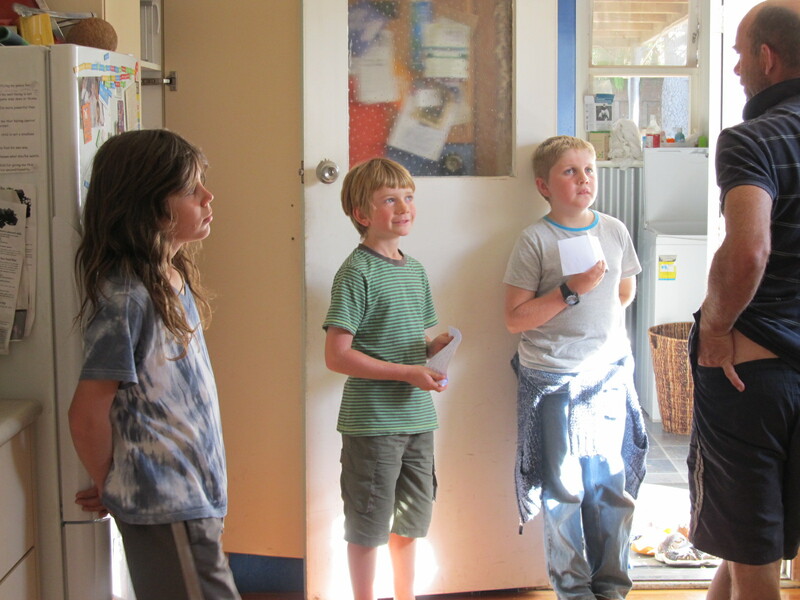 I am also enjoying the older children as they change and grow. I am loving the conversations, the new knowledge they bring to the family, the new ideas and opinions. I love seeing them blossom and become so independent. As much as I loved the years of playing.